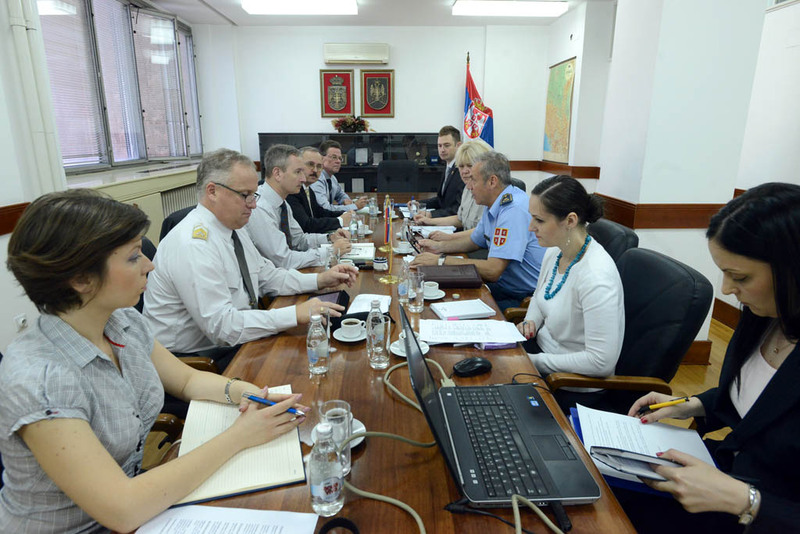 The delegation of the Federal Ministry of Defence and Sports of the Republic of Austria, led by Brigadier General Reinhard Trischak, head of the Department for Multilateral Cooperation, visited the Directorate of European Integration and Project Management of Serbian Ministry of Defence. The aim of the visit was to exchange partner countries’ lessons learned from the EU accession process. In his opening remarks to the Austrian delegation, Major General Sladjan Djordjevic, head of Serbian MoD Defence Policy Sector, pointed up the similarities of Austrian and Serbian foreign policy orientations and expressed satisfaction for the high level of cooperation in the field of defense education, training, logistics, military healthcare and the CBRN defence. On this occasion, he emphasized that both countries have similar foreign policy objectives, that they are responsible contributors to peacekeeping operations and dedicated to building a safer environment in the Balkans and Europe. Colonel Dr. Katarina Strbac, director of the Directorate of European Integration, informed interlocutors on participation of the Ministry of Defence in the negotiation process with the EU, being represented in 20 out of 35 negotiation groups, as well as the active participation in the Common Security and Defence Policy. During the visit, Austrian delegation also met representatives of the other organizational units of the MoD and SAF, discussing the current security and political challenges Europe is facing with, as well as the role of the defence system in response to them. Special attention was paid to the issues related to the adoption of the EU Global Strategy, participation in the Battlegroups Concept, cooperation under auspices of the European Defence Agency, while the Austrian side was particularly interested in the contribution of the defence system to resolving the migrant crisis.